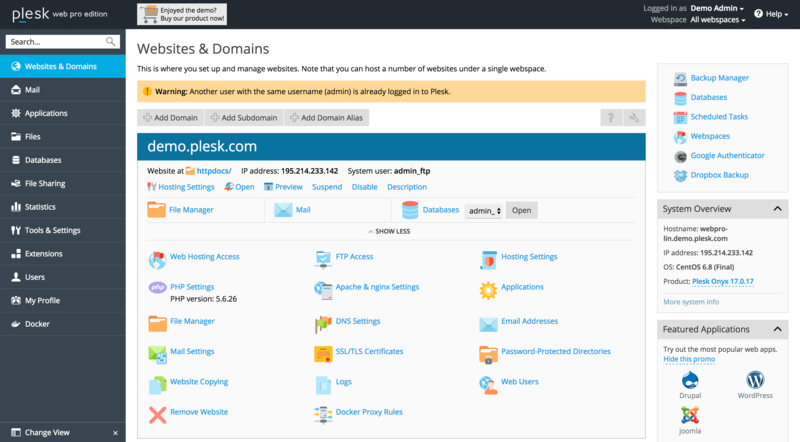 Plesk is the leading WebOps and Web Hosting platform that offers the complete set of technical, security and automation tools for your websites and online businesses. The simple one-dashboard platform helps you effortlessly build your projects, secure against vulnerabilities and automate your day-to-day tasks. Furthermore, choose from over 100 Extensions for leading tools such as WordPress Toolkit, Symantec SSL, Docker, Git, ServerShield by CloudFlare, Google PageSpeed Insights, and more. Providing a ready-to-code environment in an intuitive interface, Plesk lets you do what you’re best at: creating cloud-scaled web applications and websites for SMB’s (small and medium businesses). Integration with Git, Ruby and Node.js. Integrates with Docker containers. Some of our most popular docker containers include Redis, Memcached and MongoDB. The complete toolkits for WordPress and Joomla! to build, secure, stage, clone, sync, backup and restore, optimize and monitor all your WordPress and Joomla! instances. Administrate new websites, manage accounts, emails, server resources, bandwidth usage, and automate maintenance tasks. Plesk Extensions Catalog with over 100 tools, services and integrations like Symantec, Let’s Encrypt, Plesk Premium Email Powered by Kolab, Google PageSpeed, KernelCare, Opsani VCTR, Atomicorp, SpamExperts and Cloudflare. Web industry research shows 9 out of 10 web app developers decide on securing an application when it’s too late. 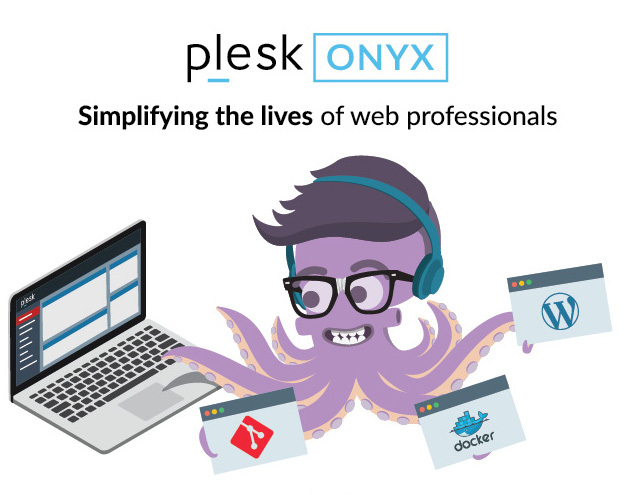 Plesk fully secures your applications and websites automatically. Configurable security at different levels- Operating System, Network, Web Application and on Plesk. 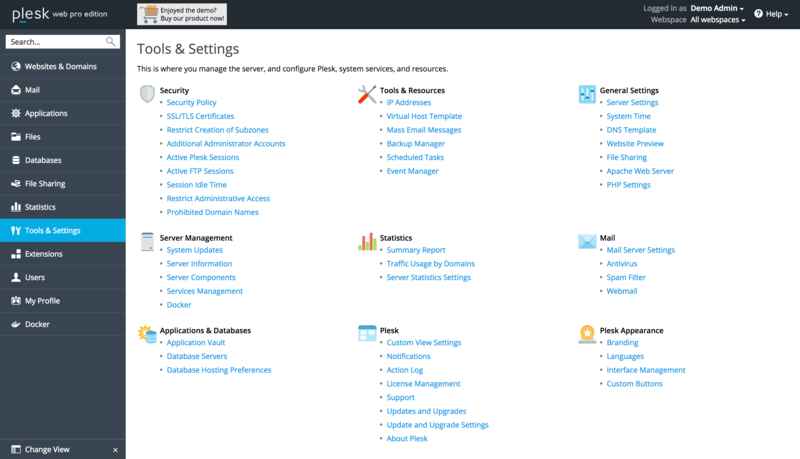 Plesk Advisor with pre-configured security settings to get you up and running with just with one click. Effortlessly set up various authentication methods, anti-spam and anti-virus protection, automatic updates, and vulnerability monitors. Defend against brute force and DDOS attacks with Fail2ban, Rootkit Detection,DDOS Protection, Firewall Managers and many more. SSL certificate manager to get an overview of all your SSL/TLS certificates. Automate your encryption with the “Keep me secured” feature. Simple and effective security for your WordPress sites with WordPress Toolkit security scanner, going beyond the basics and implementing the latest security recommendations and best practices from WP Codex and WP security experts. Focus your skills not on infrastructure management but on coding. Save crucial time by automating all server related tasks and components to run and scale your web applications and websites. Pick out processes that consume too much CPU or slow down the server and kill them with one click for more performance. Or you can limit the usage per subscription with Plesk Cgroups Extension. Tune your sites and boost load times with Google PageSpeed insights, NGINX caching, Litespeed, php 7, gzip compression, HTTP/2. Integrate business features such as Billing, CRM and helpdesk tools, and services like WHMCS, WooCommerce, and REVE Chat. Plesk takes traditional shared hosting to a whole new level.